Eagle’s Nest is a villa complex composed of three pavilions featuring contemporary Asian design. Spaces are furnished with lavishly crafted, complementary accouterments as well as installed with resort standard fittings for your total satisfaction and recreation. Nestled on a hillside sloping down to the coastline of Koh Yao Noi, Eagle’s Nest hands to you a haven of barefoot vacation living with an off-the-beaten-path kind of charm. The villa’s four glass-walled, master bedrooms are all named after species of birds inhabiting the woods bordering the property. The Kingfisher suite is on the ground level of the main pavilion. The Hummingbird and Sea Eagle suites are in an exclusive pavilion. The Hornbill suite is in another exclusive pavilion. Three of these bedrooms have king-sized beds. One bedroom has twin beds. The bedrooms in exclusive pavilions open out to furnished balconies with magnificent vistas of the bay. All bedrooms are connected to bathrooms with free-standing bathtubs and rain showers. 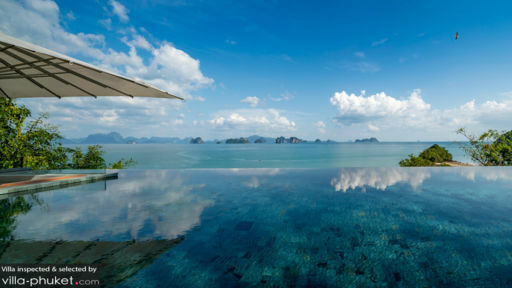 Parallel to the edge of the main pavilion’s second-level exterior is the 15-meter, glassy infinity pool with 180-degree, cinematic views of Phang Nga Bay, of the Marine National Park as well as of limestone islands – altogether considered as one of the best views in Asia. At one end of the pool is a partially shaded, sunken sala. On the poolside stone deck are pool beds where you can just lounge and get some sun. Behind the pool beds, floor-to-ceiling glass doors lead into the bright, spacious and high-ceilinged common area. At one end is the living area. At the center – a few steps behind the couch – is the dining area. At the other end is the fully-equipped, ultra-modern kitchen. 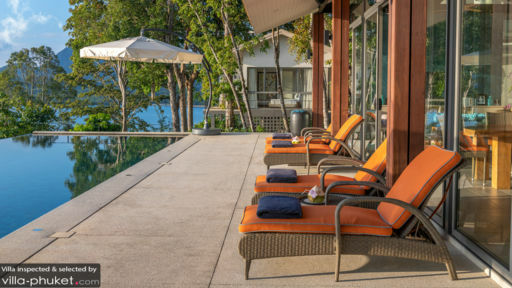 The villa’s onsite, competent staff, guided by a manager, dispenses regular services like transfers, first morning breakfast, cooking, housekeeping, pool maintenance, gardening, tours and laundry. 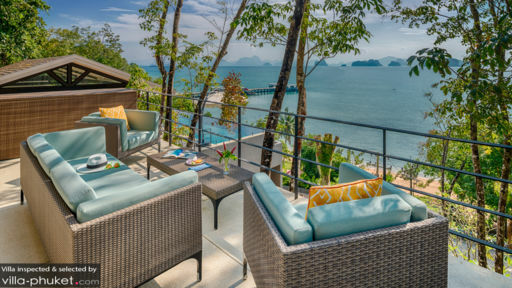 From the villa, you can, via a private road, directly access the beach where you can swim, snorkel, kayak or get onboard a traditional longtail boat to explore the limestone islands around Phang Nga Bay and even have a picnic on one of these. You can also do a foodie tour of Koh Yao Noi itself. Your itinerary should include the pizzeria La Luna, the sunset-perfect Rice Paddy and the fine dining place Six Senses Yao Noi.